Being late to the blemish balm cream craze, I thought I would dip my toe gently into the foray with Cosmetic Empire's Blemish Balm. They were giving out free samples and I wasn't sure if it was something I wanted to go nuts over. Many people have already explained what BB creams are, so I won't go into what it is here. This is just a review for reference. 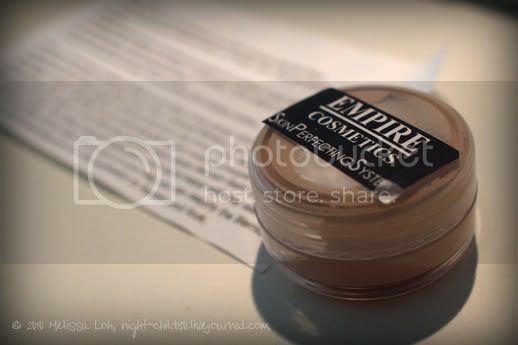 The instruction slip says to apply after moisturiser and to blend in with fingertips, ensuring the creases of the nose and eyelids are blended thoroughly. Apply your favorite moisturiser first before applying Blemish Balm. Dab a small amount of Blemish Balm on cheeks, chin, nose and forehead, and blend in with fingertips. Ensure Blemish Balm is blended thoroughly into creases of your nose and up to the rum of your eyelash line. Include your eyelids in application. 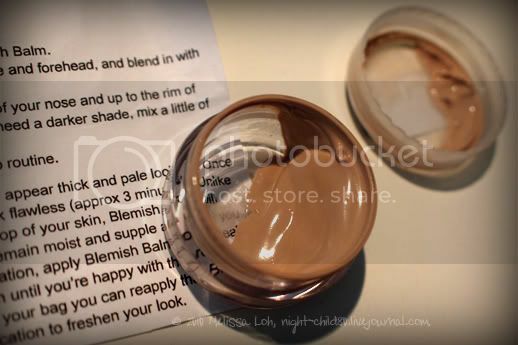 If you need a darker shade, mix a little of your own foundation with the Blemish Balm. Seal with translucent powder, then continue with makeup routine. I followed the instructions and while the coverage is gorgeous, the colour after oxidisation is not a match to my skin at all and gives my complexion a greyish hue. Not flattering. Unfortunately I have experienced some breakout (huuuuuuge zits) after repeated use, so I'm not sure if I'm doing something wrong or if this is the wrong product for me. A colleague picked up a bottle of Skin Food's Peach Sake Pore BB Cream and Aloe Sun BB Cream, both in #2. A review coming up! Have you tried tinted moisturizers? It's similar to these BB creams but the western version I guess. a. they offer very little coverage. b. they don't suit my VERY oily T-zone. ie. they make my skin look even shinier in less time. Yeah, I've only tried one so far (Physicians Formula brand) and while it's ok, the coverage is as you said, not the best, and it certainly makes my face shinier..I have kind of stopped using it because of that, especially since it's the only thing I put on my face, not even any matte powder on top or anything.